Cerebral palsy (CP) is caused by an injury to the brain at or near the time of birth . Individuals with CP have impaired control and coordination of their muscles, as well as a variety of secondary musculoskeletal impairments. Muscle synergies have recently been used to evaluate and quantify impaired motor control in CP. Synergies are calculated from electromyography (EMG) data to identify weighted groups of muscles commonly activated together. Children with CP have altered synergies during gait compared to typically-developing (TD) peers [2, 3, 4, 5, 6, 7], similar to other clinical populations such as stroke [8, 9, 10, 11, 12], spinal cord injury [13, 14, 15], and Parkinson’s Disease [16, 17]. Fewer synergies are required to describe muscle recruitment during dynamic tasks in CP, which is thought to contribute to impaired movement [2, 12, 15]. Recent research has suggested that synergies measured prior to treatment are associated with changes in gait after treatment in CP [18, 19, 20]. A summary measure of synergy complexity, the dynamic motor control index during walking (Walk-DMC), measured before treatment, has been shown to be associated with changes in gait kinematics and walking speed at two clinical centers [18, 20]. Children with greater synergy complexity, meaning synergies more similar to TD peers, are more likely to have improvements in gait kinematics and walking speed after single-event multi-level orthopaedic surgery (SEMLS), selective dorsal rhizotomy (SDR), or botulinum toxin injections type-A (BTA). While this research has suggested that synergy-based measures may be useful for treatment planning, the impact of these treatments on synergies is an open question. Researchers have proposed that treatments that can modify synergies may be clinically useful and contribute to improvements in movement [21, 22, 23]. However, whether or to what extent treatments can alter synergies or how those changes relate to functional outcomes remains unknown. Few prior investigations have examined whether synergies can be altered as a result of an treatment [24, 25, 26]. Focusing mainly on rehabilitation after stroke, these studies have found mixed results, but have demonstrated that treatments have the potential to alter muscle synergies. For example, after rehabilitation therapies in stroke, synergy complexity has been found to increase , or have minimal changes , while in Parkinson’s, synergy complexity has been found to decrease . All of these studies found some reorganization of synergy weights and/or timings after treatment [24, 25, 26]. In CP, preliminary research has suggested that there are minimal changes in synergies following treatment. For example, van der Krogt et al. (2016) reported a slight reduction in synergy complexity (i.e., further from TD peers) following BTA, while Oudenhoven et al. 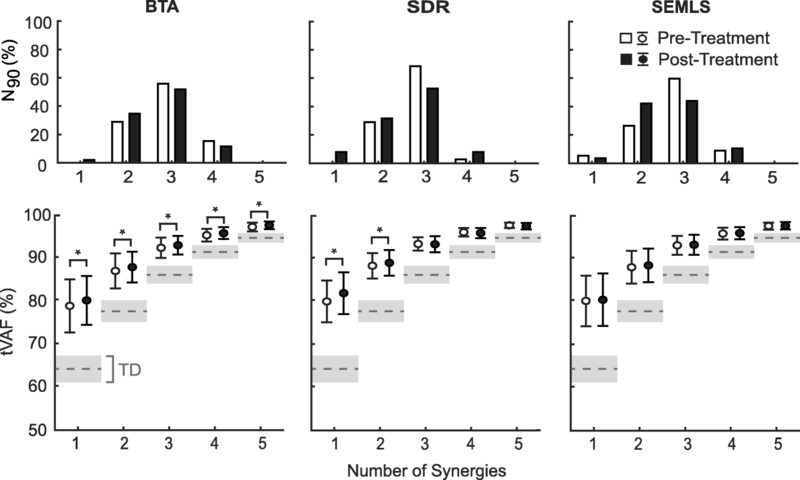 (2016) and Loma-Ossorio Garcia (2015) reported little change in synergy complexity following SDR or SEMLS, respectively [27, 28, 29]. 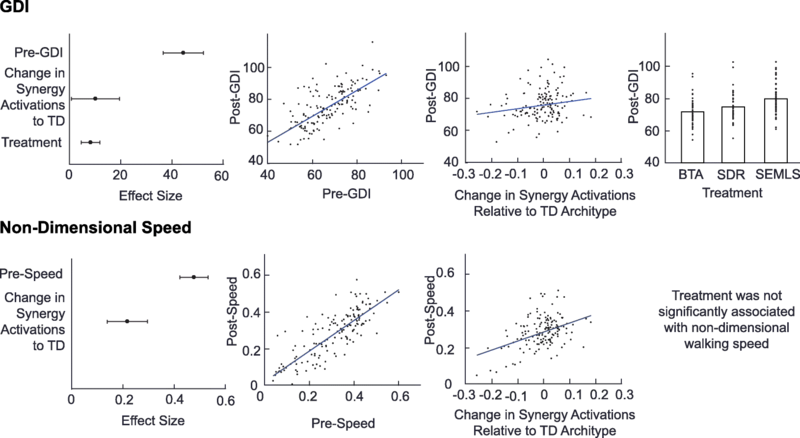 Changes in synergy weights or activations after treatment have not been examined in CP. The lack of changes in synergy composition contrasts with research in unimpaired adults, where highly trained individuals have been found to have altered synergies compared to novices [47, 48, 49]. Further, interventions such as powered exoskeletons have been shown to alter synergy weights and activations [50, 51, 52]. Whether future innovations in treatments such as feedback training [50, 53, 54], forced exploration of new movement patterns , or electrical stimulation of the spinal cord  can induce similar changes in synergies for individuals with CP remains unknown. However, children with CP have been shown to have synergies more similar to neonates or toddlers [4, 37], and the altered maturation process of the brain and descending pathways may limit neural plasticity . 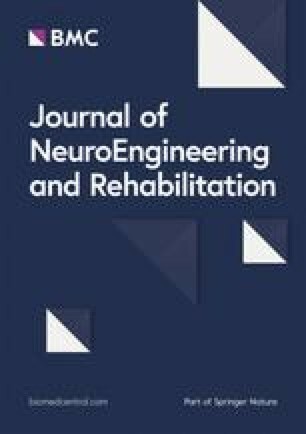 A reduction in neural plasticity could explain the small changes in synergies observed in this study even after drastic surgeries and extensive rehabilitation. 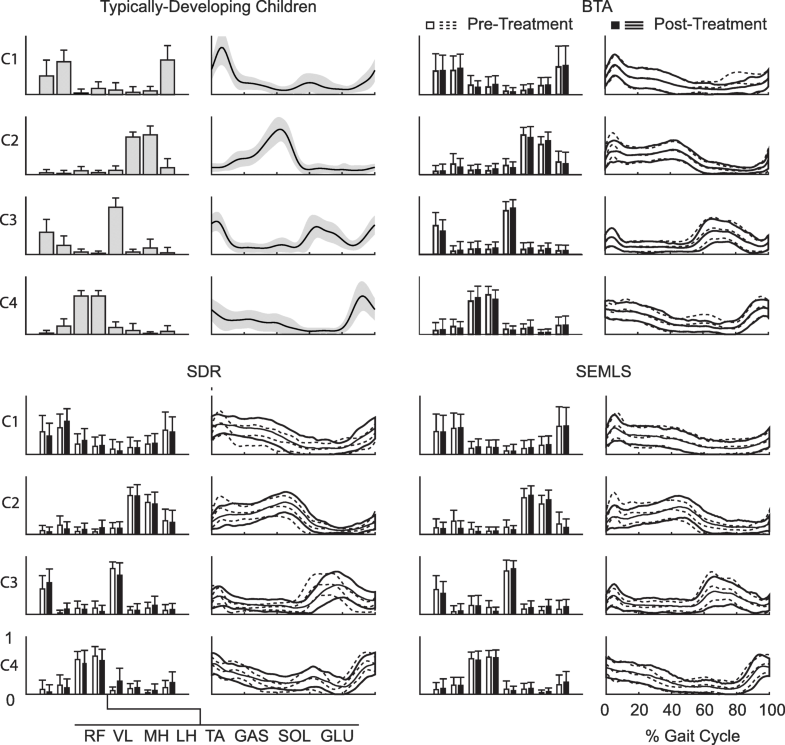 Understanding the plasticity and impacts of treatments specifically targeted at neural control represent an important area of future research in CP. As a retrospective study, this research was limited by clinical protocols. Children in this study walked without assistive devices when possible, but we did not exclude children who used them. However, walkers and other assistive devices can alter biomechanics and muscle activity [58, 59, 60], and understanding the impact of assistance on synergy complexity and structure represents an important area for future research. Although synergies have been shown to be repeatable between days for both TD and CP individuals [3, 61], the amount of time before and after treatment varied. Participants received therapy per their individual treatment plans as part of the standard of care. Thus, observed changes in synergies are due to the treatments analyzed in this study, along with a combination of rehabilitation [24, 25, 26], growth, and development [4, 37]. While the EMG data used to analyze synergies included the large muscles commonly targeted with treatment, it is possible that there are greater changes in activations or synergies for muscles not evaluated with EMG recordings as part of standard clinical gait analysis. Similarly, the amount and quality of data varied between individuals and sessions. Prior research has shown that number of gait cycles can impact synergies, especially for small numbers of gait cycles . Thus, we chose to use all available trials in our analysis, accounting for as much variability between gait cycles as possible. Missing data in some individuals necessitated the use of WNMF to calculate synergies, which could cause some changes in the synergy outputs. A post-hoc comparison between synergies calculated using the WNMF algorithm on sessions with complete data and the same sessions where data was omitted (up to 70% of one EMG channel and 30% of a second EMG channel, with non-overlapping portions) found an average change in tVAFn of < 1% for n = 1–5 synergies and an average cosine similarity > 0.95 for synergy weights and activations.